Can I use earth worms found in garden soil to recycle kitchen waste? No. Compost Worms are special, and very different to the Earth-working Worms. Compost Worms thrive above the soil, in rich organic waste. They are not the same as garden worms that live in the soil. Compost Worms breed faster, eat a different diet, and tolerate much more mucky environments than earthworms. The worms you find in soil will not thrive in kitchen scraps, and will likely die - so best to leave them in the garden. Are worms the only creatures doing the job of recycling? No. Worms get all the credit, but the real workers are the bacteria that rot the food. The most efficient worm farms are diverse eco-systems where lots of creatures exist: bacteria, fungi, protozoa, microarthropods, springtails, sow bugs, mites, centipedes. 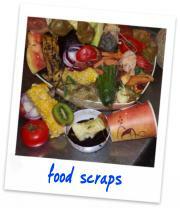 They all work together and recycle food scraps. Worms eat the bacteria, which is their primary diet (remember, no teeth!). That may explain why container-style worm farms are slow but tidy � less creepy crawlies! Can Compost Worms be added to my existing compost container to speed-up recycling my kitchen waste? Absolutely - And the Wormy-Compost is even better than regular garden compost. Some garden centers have booster packs of Compost Worms, or you can order 250g from Earthly Delights. Check out the information page on this website for more details on how to develop a healthy population of worms in garden compost. Can I use Compost Worms to improve the soil in my garden? 7) After a year of doing this, introduce soil plugs from a paddock you know has good soil worms. You should start to see improvements in about a year, but expect a soil-improvement program to take two years. How do I access the subsidy available to Schools and Preschools? Simply by contacting Earthly Delights. We are working with the Council, and will invoice you for your contribution of the costs of the recycling system. There are no application forms or lengthy waiting periods. For more information, click here. When I go on holiday, Do I need "worm-sitters"? Most systems will be fine, provided you leave the worms moist and some extra food. How much food to leave is up to the size of the system. Try cutting a pumpkin in two, and pre-cooking the halves; put the halves on top the worms, and water the bedding. Container systems may need to be shifted to a cooler place over the summer holiday to avoid dehydration. Fluff the bedding before leaving, too. For the Reln Can-O-Worms, make sure the vent holes in the legs are clear and the system can breath. What�s the difference between "bedding" and "worm food"? Compost Worms will "eat" both bedding and food waste, moving it through their gut and mixing it with enzymes to create castings. Their "food" is kitchen scraps because this matter gets all gooey with the bacteria worms need to eat, plus it�s mostly water. Their �bedding� is stuff like paper or leaves because this matter does not retain high quantities of bacteria, and it contains much less water. Worms use bedding to "breath" and breed, and use food (bacteria) to live. I recommend adding bedding material regularly to keep expanding the worm colony: when starting a new tray, or when feeding buckets to a Lil� Pig (1/2 bucket bedding for every bucket food scraps). Can I put garden wastes into my Hungry Tiger or Can-O-Worms? What about grass? Tray-based worm farms, such as Can-O-Worms, are designed for soft organic food waste, so avoid feeding grass or garden waste. The tray will fill up too quickly with material that does not suit the worms� primary food bacteria. Larger systems like our Hungry Tiger range can handle some garden waste, but think of it as "bulking" material (bedding, rather than food). Grass heats up and gets very compact, so allow it dry out into hay and sprinkle in thin layers. Never put weed seeds into a Worm Farm, and ABSOLUTELY NO OXALIUS or other bulb/root germinating weeds (e.g. mint). I recommend people have both a garden compost and a worm farm, beside each other: one for garden waste (grass, leaves, etc) and one Worm Farm for kitchen scraps. Eventually the worms from the Worm Farm will move across to the cool parts of the Garden Compost. How much water is appropriate for my recycling system? Waste and bedding should be moist but not dripping, without pooling or slimy texture. Most plastic tray-based worm farms run moist, so adding water is often unnecessary (unless you want to regularly flush-out the casting). If a system seems too moist, add some corrugated cardboard, crumbled newspaper, or dry soil. If your system is a plastic container, make sure you regularly empty the liquid catchment basin and clear the vent holes in the legs. Compost Worms can live in water for some time, but they suffocate if their environment becomes sludgy. When in doubt, give it a fluff by stirring up the waste and bedding. A moist worm blanket (e.g. natural carpet or underlay) will slow down evaporation. If you add water regularly to flush castings, be aware this can sometimes cause significant "sludgy" bedding, resulting in smelly anaerobic spots. Compost Worms will not eat plastics, glass and metals. Keep sharps out, unless you like getting poked - this includes fish bones (ouch). I don't mind leaving bits of plastics in the food scraps but I DON'T put plastics in plastic container-bin systems. I also do not put citrus peels, meat, onionskins, cook food or bread in a container worm farms (such as the Can-O-Worms), or any worm bin that is less than 6 months old. 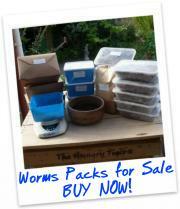 In larger systems such as our Hungry Tiger range of worm farms, feed it anything you want: meat should be buried deep in the worm bed, not too much bread, and yes to onion skins, citrus peels, garlic. Balance is important, so not too much citrus peel or bread. Never put weed seeds into a Worm Farm, as the seeds may germinate and spread wherever you use the vermicast. ABSOLUTELY NO OXALIUS or other bulb/root germinating weeds like mint! 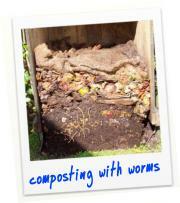 Worm composting is a cold system, and actually encourages germination of any seed/root. You may find tomatoes/pumpkin/potatoes showing up in the flower bed if you use the vermicast! Can I make a liquid fertiliser from the solid vermicast? Sure! Just add water and stir in two handfuls of vermicast; you can speed up the process by adding some simple sugars like molasses or fruit juice to the liquid, stirring it occasionally, and "brewing" the mixture for 12 hours. For an added fertiliser kick, you can add a fish-based biostimulant (for a bit of plant-available nitrogen). Apply this custom fertiliser /soil conditioner to the soil or plant leaf � you may need to strain the liquid first or take off the rose to avoid blocking a spray nozzle. How long will worms live, and how can I kill the worms? I�ve read that Compost Worms can live up to 15 years. To kill worms, simply feed them worm-killers, (e.g. pet de-worming medicine or poo from an animal recently de-wormed), or let your worm bed dry out. Overly hot (above 30 C) or acidic conditions (<3 pH) can kill worms. Vacuum bags can have chemicals, such as carpet clearers/deodorant, and have been known to kill worms. I do not give worms hair from a salons, colored paper or ash from treated wood (heavy metals) or pea straw that's not organic (a personal preference only) - though none of these have killed my worms. When it's hot, I water and watch for stress - and use ice packs if I'm transporting worm packs!